Ready to Fork Over Your “Fair Share”? Unless you’re living under a rock, you’ve surely heard by now of Rep. Alexandria Ocasio-Cortez (D-New York) — “AOC” to the politically hip — the 29-year-old “democratic socialist” who’s turning Washington on its ear. It seems as if everyone’s supposed to have an opinion about her. Even Agora founder Bill Bonner and my colleague Brian Maher at The Daily Reckoning have felt compelled to weigh in recently. At least one poll — sponsored by The Hill and HarrisX — finds 59% support among registered voters for “raising the highest tax rate to 70%.” There’s majority support among both men and women, and in all regions of the country. Yikes… The polling question didn’t even mention AOC’s caveat of that rate applying only to income in excess of a $10 million threshold. We’ll come back to the merits — or lack thereof — of this proposal momentarily. We had an eye on Ocasio-Cortez long before you likely heard of her. During primary season last year, she’d captured the attention of progressives fed up with the centrist Democrats who sandbagged Bernie Sanders’ 2016 presidential campaign. 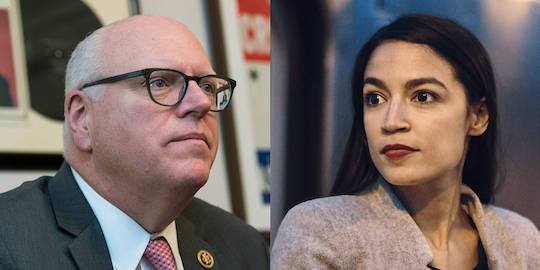 If Sanders couldn’t knock off Hillary Clinton, at least maybe this telegenic upstart from the Bronx could unseat the entrenched Rep. Joe Crowley. Crowley was one of the hackiest hacks to afflict Capitol Hill so far in the 21st century. After 10 terms of kissing the right backsides, he’d become a potential successor to Nancy Pelosi in the House Democrats’ power structure. No more: AOC pulled off a stunning upset with 57% of the vote. For establishment Democrats, Crowley’s defeat was as big a shock as establishment Republicans got in the 2014 primaries — when an unknown tea partier named Dave Brat knocked off House Majority Leader Eric Cantor (R-Virginia). 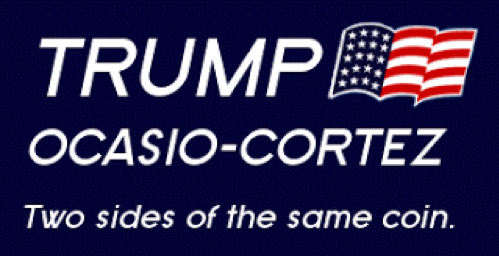 From the start we’ve been struck by how — like Donald Trump — AOC manages to offend so many of the power elites who’ve run America into the ground. That can’t be a bad thing. And like Trump, she’s befuddled mainstream media types. So with that essential background… what about that top 70% tax rate? AOC — and the smattering of “public intellectuals” who’ve risen to her defense — point out we had a 70% top rate as recently as 40 years ago. Which is true. On the other hand, there were scads of loopholes wealthier filers could use to skirt those high rates. 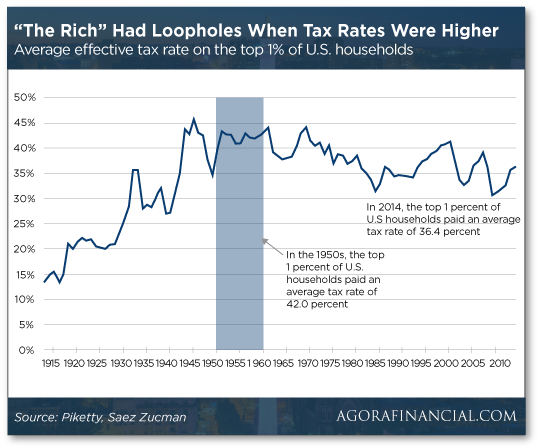 Most of those loopholes have since gone away — starting with the Reagan-Rostenkowski tax “reform” of 1986 and continuing every few years since. 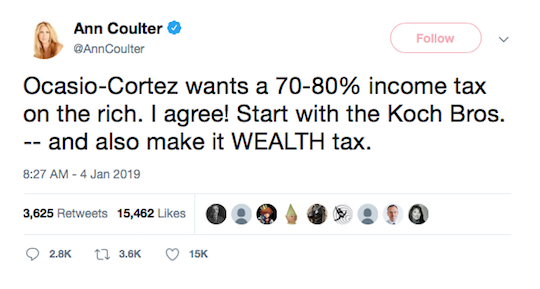 Even AOC’s fellow travelers in academia like Thomas Piketty — who made a splash five years ago with his proposal for a global wealth tax— would concede that taxes on “the rich” weren’t much higher in decades past than they are now. Ah, but here’s the rub. The wealthiest of the wealthy still have the option of keeping their income from being classified as “income” in the first place. Here’s the most worrisome part: The tax proposed by Ocasio-Cortez would raise only a negligible amount of new revenue. The Washington Post assembled some mainstream policy wonks to run the numbers. They found such a tax would raise $720 billion over a 10-year span. That’s an average of $72 billion a year — less than 2% of the total amount Uncle Sam spent during fiscal 2018. But the nonpartisan Tax Foundation says those figures don’t account for the fact “the rich” will find ways to keep their taxable income under the $10 million level. By the researchers’ reckoning, the take might amount to only $189 billion. So let’s go back to that top 70% rate from the Jimmy Carter era. A married filing jointly return in 1977 was subject to a 70% rate on any income over $203,200. Translated into current dollars, that’s $839,216 — much less than AOC’s $10 million threshold. What’s more a 50% rate was imposed on any income over $47,200 — or in today’s dollars, $194,220. And a 36% rate was imposed on any income over $27,200; in today’s dollars that’s $111,570. Ouch. To the markets… where all’s quiet. The Dow is down a bit, the S&P 500 and Nasdaq up a bit. Gold is holding the line on $1,290. Crude is back below $52. We’re experiencing our first meaningful drought of economic data this week, thanks to the “partial government shutdown.” The Commerce Department is closed, so we didn’t get housing starts today, nor retail sales yesterday. But the Federal Reserve and its regional banks are still open for business. This morning’s Philly Fed survey shows manufacturing is still hot in the mid-Atlantic region. That’s especially good news given the weak report on factory activity in New York state two days ago. Meanwhile, the Fed’s “Beige Book” is looking dingier than usual. The Beige Book is the name given to an every-six-weeks summary of U.S. business conditions, based on interviews with bankers and businesspeople across all 12 of the Fed’s districts. A decade ago, our executive publisher and 5 founder Addison Wiggin took to calling it the “Lily White Book,” given its penchant for unfounded optimism. But the current edition finds that in “many” Fed districts, the mood “had become less optimistic” for a host of reasons — volatility in financial markets, rising short-term interest rates, uncertainty about the trade war. The report — striking for its level of honesty — will be one more thing the Fed can point to when justifying its decision to hold off on any more increases in the fed funds rate for now. Sears is still a dead man walking, despite the news today. At the last minute, Sears chairman Eddie Lampert ponied up another $150 million to retain control of the company he ran into bankruptcy court last fall. That means about 400 stores will remain open and 50,000 people employed. At least for now. Many factors have contributed to Sears’ slow-motion demise — online shopping, the massive debt Lampert took on, Lampert’s peculiar approach to management — but “the one thing a company cannot do if they hope to recover is sell off their income producers,” Robert Kiyosaki wrote last year in his entry-level Rich Dad Poor Dad Letter. For Robert, it’s all about the cash flow — in your personal finances, and in business. And Lampert cut off that essential income stream. “Within the span of only a decade, Sears liquidated Craftsman tools, Kenmore, Coldwell Banker and its entire $30 billion credit portfolio. Basically, leadership pawned off everything that actually generated revenue in exchange for quick cash infusions. This is the path of a dying company. Well, this was probably inevitable: Police in Oklahoma have hauled four men into custody for transporting… totally legal industrial hemp. Hemp is the version of cannabis that has next to no THC content — that is, the stuff that makes you high. Despite this fact, hemp was still a controlled substance until four weeks ago — when Congress passed and the president signed the Hemp Farming Act of 2018. A Denver-area company called Panacea Life Sciences ordered a hemp shipment from growers in Kentucky. “We pre-screened it,” says company president Jamie Baumgartner, “to make sure that everything was legal according to the federal definition of hemp.” The truck’s manifest listed the cargo as hemp. He says contractors got clearance from the state of Oklahoma on the way from Kentucky to Colorado. And yet the Pawhuska, Oklahoma, police force seized the $500,000 shipment and arrested four men. Yes, the men will likely be freed and (hopefully) the hemp returned. “But hemp and marijuana are both forms of cannabis, so they look and smell alike,” writes Mike Riggs at Reason. P.S. Despite that caution (or stupidity or malice) on the part of law enforcement… the wave of cannabis legalization is all but unstoppable. Huge fortunes have already been made… and if you think it’s too late, America’s No. 1 pot stock expert Ray Blanco assures you there’s still time. But you won’t want to wait much longer. Follow this link and Ray will show you why you’ll want to get started within the next three weeks.